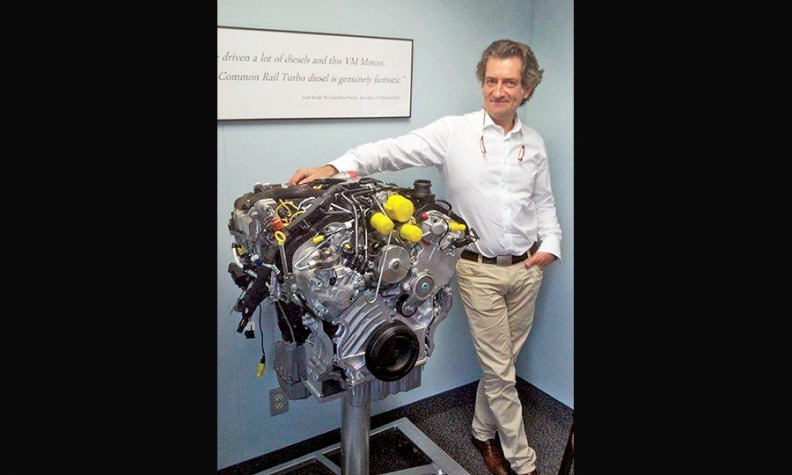 De Vivo: "We can sell engines to anybody." VM Motori S.p.A. is the Italian engine manufacturer whose light-duty diesels were introduced this year in the 2014 Jeep Grand Cherokee and 2014 Ram 1500 pickup. Their sales success is likely to determine whether Chrysler expands its diesel offerings to other nameplates. Chrysler is VM Motori's biggest client and accounts for nearly 85 percent of its global sales. VM Motori is owned 50-50 by Fiat and General Motors. Raffaele De Vivo, 47, the Italian president of VM North America, spoke with Staff Reporter Larry P. Vellequette on July 1 about the engine company's future in the United States. Q: How many engines does VM Motori produce a year? A: This year, because of the Grand Cherokee in NAFTA, we will be around 86,000. Last year, we did 55,000. We are investing more than 80 million euro [$104 million] to increase our production capacity. We are increasing our manufacturing capacity very much, but everything will be built in Italy. How much room do you have in your factory in Italy to meet future demand for products in North America? We have real estate where we can increase our capacity. The plan right now is to get up to 90,000 V-6 engines this year, but we can increase up to 50 percent more in less than two years. Are you running three shifts? We are running three shifts on the machining line, and two or three shifts on the assembly line, and three shifts on the hot test facility. We hot test 100 percent of the engines right now, but we are considering going to cold and hot test in the future. Where are you selling engines in Europe right now? We supply the London taxis on the automotive side. Other than that, everything else is Chrysler. We also have many other marine and industrial customers. Is there any thought of VM Motori moving any production to North America? No, as of right now, that has never been discussed. Why aren't North American consumers as enamored with diesel as Europeans? I think for the American customer, the diesel memory is not as refined as we can provide in the diesel engine right now. The Jeep Grand Cherokee with the V-6 diesel engine is state of the art and the NVH is very nice. In Italy, we say that you buy the power and you drive the torque, and this is exactly what a diesel is; it's a lot of torque at a low engine RPM that is available anytime so that you don't downshift so much. And then you smile when you fill the tank; it's a 25 or 30 percent better fuel economy, diesel versus gas. But if you pull, or if you drive aggressively, the difference is going to be much, much more. Now that Jeep is getting to the [diesel] market, as well as the Chevy Cruze, Americans will be more attracted to consider the product, I think. Does VM Motori have an exclusive contract with Chrysler, or can you sell engines to anybody? We can sell engines to anybody. Of course, Chrysler is not only a customer, it's also 50 percent of the ownership. But I've never seen any stop on opportunities. Who are VM's main suppliers? Bosch is the main supplier for injection systems, Honeywell for turbo -- those are the main suppliers. Our V-6 blocks are cast in Brazil. The four-cylinder blocks are cast in Portugal. How many engines could you build for Wrangler if you're also building diesel engines for the Grand Cherokee and Ram 1500? That would be a different engine. It would be the four cylinder for the Wrangler. It's a different assembly line. We have an easy capacity for 40,000 engines per year, and today we build 10,000 four-cylinders. We are a supplier that is not designed for high-volume production. We are designed for lower-volume, so if we build one part number less than 60,000, that is our job where we are effective and good at. If we have to build 500,000 engines the same, that's not our job. I don't know that we're the best supplier for that. So what do you think holds back greater acceptance of diesel technology in the United States? I think No. 1 is fuel price. At the end of the day in Europe, diesel is 10 or 20 percent cheaper than gasoline, always, winter or summer. In the U.S. in the summer, diesel and gasoline are about the same, but in wintertime, diesel is 30 or 40 cents more per gallon. But it's also probably the culture. Everyone in Europe has driven a diesel or had a diesel in his garage or his father's or a friend's. But here it is different. But I see that coming, mainly for trucks. I think that the Ram 1500 diesel is a genius idea, and as many genius ideas go, it's very simple. It will be from those guys that the mentality will change. In terms of your supply chain, how far in advance are you building engines to get them into a Grand Cherokee today? It takes 30 days from our gate to the plant gate in Detroit. They normally have one week of inventory, and we normally have one week of inventory or less. Our block comes from Brazil, so the block that they are casting July 1 in Brazil is arriving in Italy in mid-August. It's going to be built the beginning of September, shipped by Sept. 15, and arrive in Detroit by Oct. 15.